YT: What are you most excited about right now at Forrest Yoga? We are bringing the Forrest Yoga tribe together for the first-ever Forrest Yoga worldwide conference, WIND HORSE, and it is incredibly exciting for me in so many ways. Myself and the Forrest Yoga Mentors/ Guardians, will be teaching for three days at Snow Mountain Ranch outside Denver, Colorado from August 17-20. All people curious and fascinated with yoga are invited. I can’t wait! 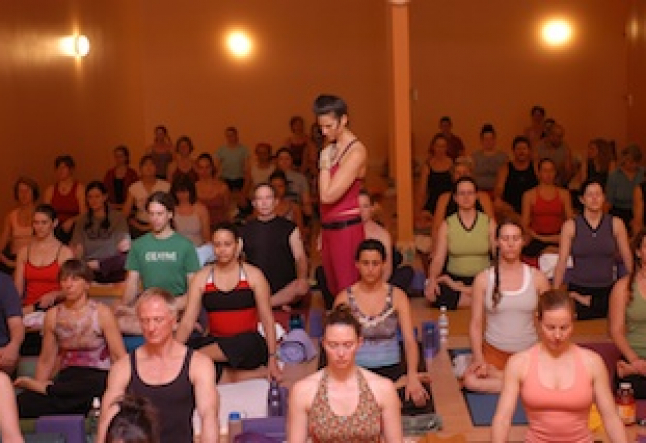 It feels so good that Forrest Yoga has gotten to the place that I have been aiming at for a really long time. This is such a powerful practice and system of yoga that attracts intelligent, multi-faceted people. This gathering of our tribe will make us all richer as we forge new friendships within this long-reaching web of our Forrest family. Our people will make life-long friendships here; that’s powerful. That’s what happens in a lot of our courses and workshops. People meet other people that they are inspired by and that they love and want to stay connected to for the rest of their life, and they do! I have an innate intuition as a Medicine person that this event will be a huge quantum leap for Forrest Yoga, and Healing the Hoop of the People. YT: Who are the Forrest Yoga Guardians? 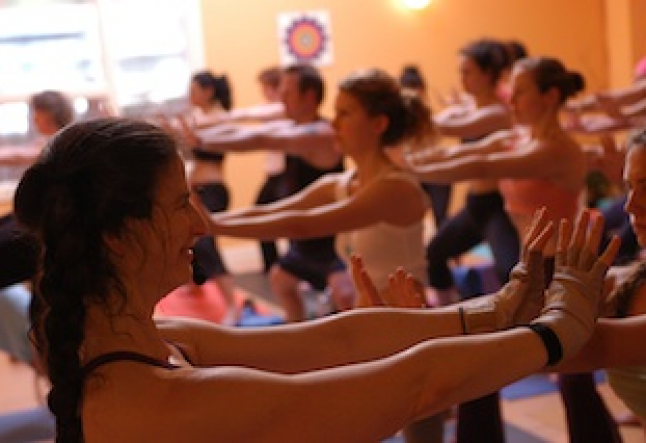 They are the handpicked Forrest Yoga teachers who have pledged to carry and protect the legacy of Forrest Yoga. One thing in particular that is most exciting to me is bringing forward the Forrest Yoga Guardians on a world stage. I have such an unusual group of people that are Forrest Yoga Guardian teachers. It takes a lot to be a Guardian teacher and now they will actually get the attention and spotlight they deserve. Wind Horse will give them a place to stretch their wings in a way nothing else has. I learn so much from my Guardian teachers. I’m so delighted to experience what they’re teaching. I get to be there with these people that I’ve witnessed grow and expand and become extraordinary – how great is that?! I am really fascinated by what they will choose to present because they each have such wide, varying interests, beliefs and skills and such big hearts and souls. I’m thrilled and curious… wow, what are they going to do? My Guardians teachers are clear-thinking people with their own passions and their own fire! YT: What does WIND HORSE represent for Forrest Yoga? Wind Horse is the Forrest Yoga term for riding your breath into vision quest and the great mystery of yourself. The vision I literally see is of a star spiral spiraling into the valley where the conference is being held. In the valley, the star spiral combines with the energy of sparkling, crystalized, snowmelt glacier water. These energies melt into a waterfall, coalescing to become the delicious sparkling clean lake of the conference itself. In this pure water we are immersed to be bathed, blessed, cleansed and refreshed. Re-inspired, we go out into the world; then that incredible energy spirals out with each individual! Each person will take this turned-on, inspired, star-sparkle energy with them. Thus begins the thrilling next chapter for Forrest Yoga! YT: Why have you invited two Medicine Chiefs? My Native American Medicine brother and sister, and Medicine chiefs in their own right, Alex Turtle and Chenoa Egawa, will be joining us and leading ceremony. Very few people have the privilege of getting to work with someone of that authentic power and status in the Native community. Alex and Chenoa are reaching to the Forrest Yoga tribe, bringing their extraordinary Medicine. Spend time with Alex and Chenoa and you get to feel how they feel their world, in communication and connection to the earth and sky and Sacred ones. This is a profound inspiration for how to walk in Beauty. We all want to learn to do that, even though we don’t quite understand how yet: how do you live day-to-day in that level of connection? Alex and Chenoa do it. That’s a wonderful thing to learn from them, along with the chants and hands-on healing, or any other specific thing they are teaching… They Walk in Beauty and that’s a powerful thing to learn. YT: What will people experience at WIND HORSE? You will get a tremendous amount of tools to take back to your own yoga practice; ways to relieve your own pain, and strong and fascinating ways of bringing in intent that sweetens and enriches your practice. Then you learn how to set and hone your intent for your life! You will connect deeper to yourself in ways that you can’t even fathom without experiencing it. These are some of the gifts that you will get. You will also have the fun of exploring and walking within the Great Mystery. Dive into whatever surprises that come up especially for you, from being in the presence of the powerful medicine. I don’t know how that will work specifically for you, but it will work in a good way because that is how Good Medicine works. (PS, that is part of the juiciness and why it’s called a Great Mystery – we don’t know!) I do know that there will be Beauty, there will be surprises, there will be tears, there will be heart opening experiences, there will be making good friends. Here we find, in our own uniqueness, extraordinariness, fears and doubts, that we are not alone. There are people that are walking next to us all over the world and some of them we will get to meet at Wind Horse. That will be tremendous. YT: What is so special about the changes happening in 2012? This is a year of power. I love that Wind Horse is happening in 2012! Look at all of us coming together in beauty to share and teach and enrich each other and ourselves! By our efforts, we set the energy and intent for how it goes from here on forward. I can’t wait to be under the starscape in the Colorado Rockies with my tribe. What a great thing to be doing in 2012! This is a pivotal year for the human race. Isn’t it awesome that at the ending of the Mayan calendar, we can create a powerful foundation to step into something new and unknown!